If you don’t find the answers to your questions below please use our Ask the Tech form to send us an email describing your problem or question. To what depths do your locators find objects? Does your Pipe and Cable Locator work on Plastic Pipes? Yes, if the pipe is fitted with a tracer wire or a sonde (a miniature transmitter) can be inserted inside the pipe. Will your magnetic locators find old coins, brass, gold and such? No, our magnetic locators will only locate ferromagnetic metals (i.e. iron, steel). Coins, gold and brass do not contain ferromagnetic materials. What are the differences among the GA-52Cx, GA-92XT and GA-72Cd? The GA-52Cx is an easy to use, reliable, magnetic locator. The GA-72Cd is basically the same as the GA-52Cx but has an LCD meter display reflecting the relative signal strength and polarity of the magnetic field detected. The GA-92XT is a portable, retractable version of the GA-72Cd, providing one-handed operation and easily removable battery. What is the difference between metal detectors and magnetic locators? 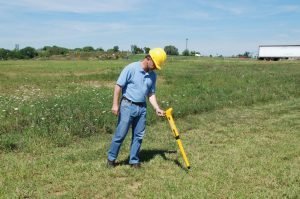 How accurate is the depth reading on a pipe & cable locator? Depth accuracy varies, as it is dependent on the method of connection to the target utility, the operating frequency, the placement of the ground stake, and the presence of other nearby utilities. As a general rule the conductive mode, lower frequencies, and less congested areas yield more accurate depth measurements. Always interpret the depth measurement as an approximate measurement and proceed with caution before digging to that depth. What frequency should I use? If you will be locating various types of utilities (power, water, sewer, etc. ), or will be working on various types of soil (clay, sand, very wet, very dry, etc. ), then you will most likely need to use different frequencies. In that case a multiple frequency locator is the best choice. Otherwise a single frequency locator may be sufficient. Lower frequencies travel longer distances and are less likely to 'jump' to adjacent utilities, but don't do well on poor conductors. Higher frequencies do better on poor conductors, but will travel shorter distances and have a tendency to jump to adjacent utilities. Always start with the lowest frequency possible and go up if necessary. How easy are your pipe & cable locators to use? Although our locators are user-friendly and simple to operate, learning the locating techniques and tricks of the trade require some basic training. Our manuals and training videos are great sources of information to achieve that training. In addition, factory support is always one phone call away. Over time, experience will provide the best advantage in the use of your locator. How do I operate my XTPC charger? 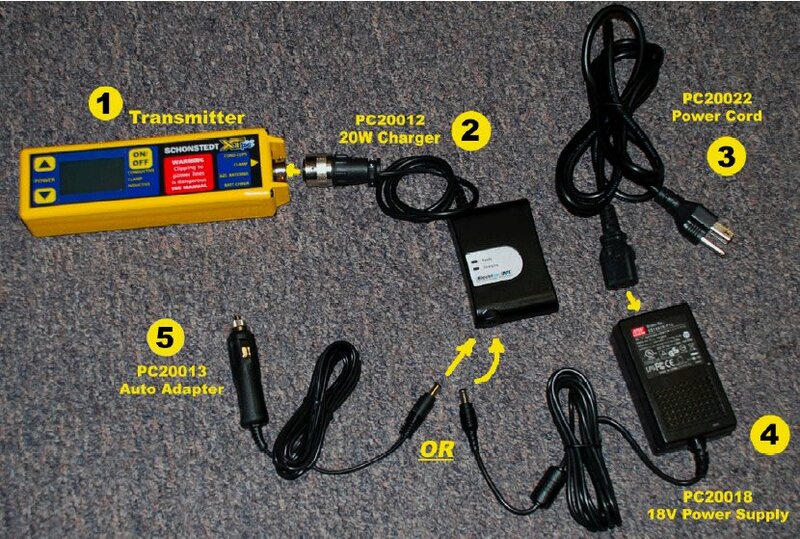 Click image to view full size image of the XTPC charger instructions. How do I search along a chain link fence? Searching in the vicinity of a chain link fence requires a reduced sensitivity setting and some control over the orientation of the locator. Position the locator horizontally with its long axis perpendicular to the fence. This ensures that the upper sensor is kept away from the fence. 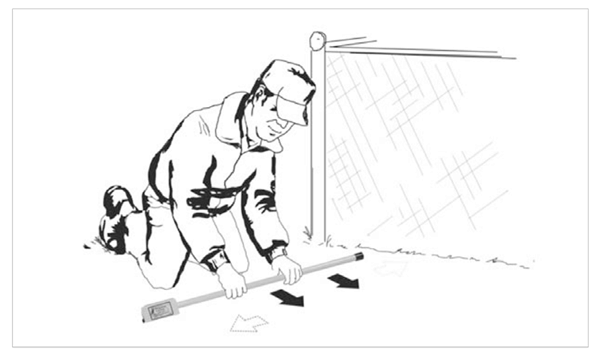 Perform the search by slowly moving the locator forward along the fence while also moving it to the right and to the left. As you move forward, this technique will allow you to search an area several feet wide. Listen for an abrupt drop in the signal that will occur when the lower sensor, located 1-5/8 inches from the end of the locator, is directly over the stake. Any variation in the position of the locator will produce an abrupt rise in the frequency of the signal.